The 2016 Summer Nationals in Dallas, Texas, was our most successful Nationals yet! 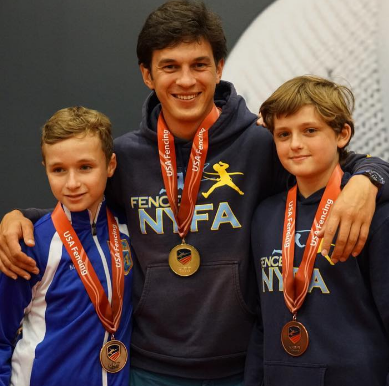 We beat many of our records and achieved new heights, and we earned the most epee medals of all clubs in New York: eight medals and one coaches medal! If Y10 wasn’t cancelled, NAC gold medalists Anna Temiryaev, Caralina Khrol, and Ian Goldfine would likely have added three more golds. They deserve kudos for working hard and coming to Dallas ready to win. Nationals was a huge success for Alan Temiryaev. Even though he’s in Y14, Alan made top 16 in Division 1, beating some of the top Juniors and Seniors. But that was just a start for Alan who took the Champion title in Cadets, showing really strong will and composure. In the bout for top 8, Alan was losing 9-2 but managed to turn it around, and from then on, Alan was unstoppable. He also claimed Silver in Y14 and finished the season just a couple of points short of 1st ranked in Y14. Anton Chmut added to our success in Cadets by making top 8. Anton also made top 16 in Juniors which was his best personal result. Great fencing was also shown by Mark Dolgonos and Skyler Liverant. Both made top 16 in Y14 and earned their C2016 ratings. Ethan Kushnerik and Mark earned medals in Y12 and finished the season ranked 1st and 4th in the US, followed by Skyler Liverant (5th) who will start the season as number one seed in Y12. Jaclyn Khrol showed amazingly consistent results as she medaled in all three age groups in which she competed! Still in Y12, Jackie made top 8 in Cadets, top 8 in Y14 and claimed the National Championship title in Y12! Jackie earned her A2016 rating and I earned my first coaches medal! She finished the season as number one ranked in the nation. Great job, Jackie!! We had success in the Senior team event as well, where Romain Cannone led our team to a top 8 finish against one of the strongest teams in the country. We beat the team that included the #2 and #4 ranked Juniors. Not to mention that NYFA teammates Nathan Vaysberg and Anton are Cadets. We lost to the same team a year ago, and this year we proved how much stronger we’ve become. Romain also did a great job making top 16 in Div1. 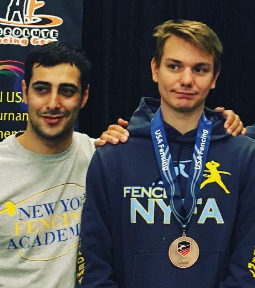 In addition, four of our students earned USA Fencing’s All-Academic Team honors for excelling in high school: Anton Chmut, Alan Temiryaev, Anna Lanzman, and Joshua Shuster. Overall, I’m very happy with our results and I know that the better results we show, the higher the standards and expectations from parents will be. We will strive to measure up to these standards. But I can say that even the kids that didn’t do as well as they hoped, can be proud of themselves and be proud of being part of NYFA. Together, we really made our club one of the powerhouses in the US in youth fencing and we are starting to transfer this success to older age groups as well. I think we made some noise in the fencing community and we will continue to improve to become even better. Thanks and congrats to all the kids, parents, and coaches for a great year, and surely we will work to make next season even more exciting!